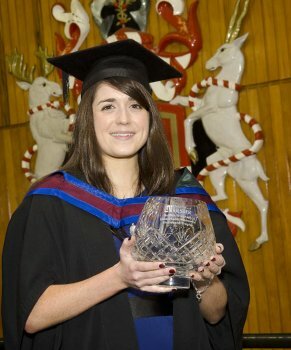 As well as gaining a distinction in her journalism Masters degree, 23-year-old Nicole Keohane from Dunshaughlin, Co Meath, is also the winner of the inaugural Belfast Telegraph Helen Scott Memorial Shorthand Trophy, which is awarded each year to the top-performing student in this area of the course. Says Nicole: “I am really delighted to win the trophy. I put a lot of time and effort into my shorthand over the course of the year – it makes you feel all those hours of practice were worth it. Nicole had to achieve 100WPM and achieve full marks in a new element of the exam. Before embarking on her MA, Nicole worked in the radio industry in Dublin – mainly in research and production – and is keen to pursue a career in broadcast journalism. “The MA course at the University of Ulster was fantastic,” she says. “It is one of few courses to focus on developing cross-platform journalism skills from print through to TV and radio. “As part of the MA you also do your National Council for the Training of Journalists (NCTJ) examinations (including shorthand, law, public affairs and news writing) which are vital to succeed in today’s media industry. “The fact that we were just a small class of 14 was also really beneficial, as you develop a great relationship with your lecturers and classmates – there is lots of debate and team work which makes for an interesting and creative learning environment. “The radio and TV production modules were definitely the highlight for me – the production of a 15-minute current affairs programme is challenging, creative and incorporates all of your core journalism skills. “The course as a whole provides the skills from which to launch a career in journalism –­ especially the work placement. I spent six weeks with ‘Below The Radar’ – an independent TV production company based in Belfast. “I had a unique opportunity to work with really skilled investigative journalists and produce an original piece about the price of pain relief in Northern Ireland, which was published on both The Detail website and The Daily Mirror NI.